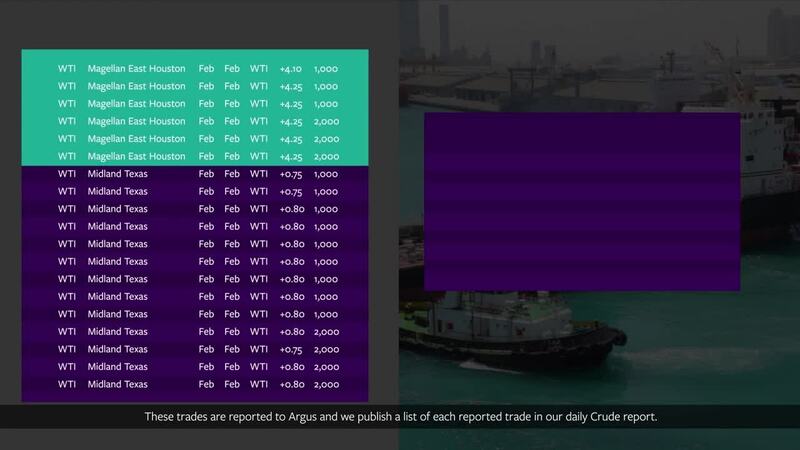 The Argus WTI Houston price assessment is a US Gulf coast benchmark price assessment determined by trades done at a differential to the CME Group’s Nymex Cushing futures price. The Argus WTI Houston price assessment represents Permian-quality WTI arriving by pipeline and traded at Houston. It provides the settlement mechanism for financial contracts listed on CME and Ice, and is a price guide for trade in other light sweet grades at the US Gulf coast and for light US crude loaded for export at the Gulf coast. The market for WTI at Houston is supplied by the rapidly growing production of Permian-quality WTI. The market has more trading participants than any physical crude market outside the US Gulf coast, and it typically sees well over 100 trades/month, making it among the most transparent crude markets in the world. WTI Houston can be exported or stay at the Gulf coast to compete with domestic and imported grades, enabling the price of WTI Houston to reflect shifts in global market fundamentals. This allows WTI Houston to be used as an indicator of value for US light sweet crude exports in much the same way that global benchmarks such as Brent or Dubai reflect values in their respective regions. Anyone with exposure to light sweet crude from the US Gulf coast will find the Argus WTI Houston price assessment beneficial. Traders, risk managers, planners, analysts, finance officers, senior executives, national, independent and international oil companies, regulators, exchanges and government officials use the Argus WTI Houston price assessment.